The buttons in calculator appear to push in when activated, as they do in Microsoft Windows application. This is an optical illusion, achieved by changing the shading around the edge of the button. To use the calculator, the user types the digits of the first number, then an arithmetic operator(/,*,+ or -).then a second number, and then the equal sign(=). The answer is displayed. You can chain to another calculation: The answer automatically becomes the first operand, so you can press another arithmetic operator and key in another number to get the next answer. You can use a decimal point in the numbers you input, but not the exponential notation. The output has a fixed decimal place. 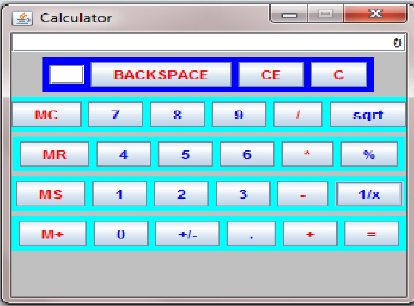 Unlike in C++, here in calculator using JAVA, calculator screen display has its buttons activated by mouse and not by keyboard pre-defined shortcuts. Though coding can be done in a better and compact format, now being a preliminary user; I’ve just focused on coding and java. I’ll soon try and post my upgraded version of the same and varied other programmes of calculator after analyzing time and space complexity of the programme. Here what I’ve done is that I’ve added buttons onto panels and used 2 textfields – one for integer calculation and the other for marking memory operations. Textfields could have also been implemented in array fashion for ease. Method of calculating in calculator has been kept simple as Standard Microsoft Calculators. Event Handling has been used where a source generates an event and a listener is notified when an event occurs say when a button is pressed using a mouse. Good post, keep up the good work. But I would suggest to put the code in a separate frame from where one can get the provisions of copying the code directly. Thanks 4 liking…based on your suggestion, i’ve re-framed the source-code in a printable format and can now be easily copied. Note the first line of the code, the comment starts ‘/* ‘ but does not end. Here are some issues i have noticed. The computation 2 + 0 = is returning 4. If i enter any number for example 2 and then press = then the answer being displayed is 0, were it should be 2. I’ve modified and corrected the code for comment and 2+0=2. but for 2=2 case,in my machine,it is running successfully since beginning. And thanks for liking my work. Good luck in your Java learning journey! Thanks 4 encouragement! Recently i had started a project work with Andriod Programming but soon had to stop for lack of knowledge. But now after seeing your blog,it seems i can again restart my work.Great job by you.